Description: "Incredible" is the only way to describe this moth. Every color is represented on the wings and body of this spectacular insect. The bright coloration advertises their distastefulness. This advertisement is called aposematism and has been naturally selected for thousands of years. The plants the caterpillars feed on contain large amounts of distasteful alkaloids, these chemicals are stored by the moth for its own defense. 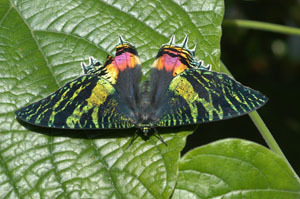 Interestingly, this moth is often erroneously referred to as: "the most beautiful butterfly in the world".